It’s no secret that we are big fans of Donna Karan New York and DKNY; both are equally as fab. Since we had the privilege of writing about the launch of the #stories fragrance back in July, we thought now might be a good time to revisit and check out what is happening as we enter the busiest shopping season of the year. We can’t quite put our finger on it – is it the classic New York heritage? Is it great marketing, advertising or communications of the labels and what they stand for? Perhaps it’s the combination of high-end luxury pieces with the everyday comforts of, say, the trendy logo collection, all under the same roof? We suppose, in the end, it doesn’t matter much. What does matter, however, is that DKNY has come with another clever, inspired campaign, a brilliant endorsement of a passion for New York combined with an ingenious display of fun fashion, all launched with plenty of time to spare before the emphasis on Cyber Week. And, our observations, are derived even before we looked at one stitch! Not all that surprising, however. DKNY has really mastered effective marketing, with inventive and imaginative themes that, of course, scream audience engagement. The current campaign is no different. Although, it could be the best yet. Sophisticated Luxury of Donna Karan New York or Cool, Youthful-Inspired DKNY? Having revered all things Donna Karan since the late 80s, I consistently find myself challenged. I struggle with where to start, which label? Do I go with the luxurious, sophisticated feel of the Donna Karan New York label or, accentuate my younger self with the, dare I say, “reasonably priced” collection of the youthful, inspired DKNY label? For all intents and purposes, with respect to functionally on the website, they are interchangeable, it makes little difference what you type into your browser. Now, to someone on a budget, deciding where to start, could have considerable influence on the wallet. In my experience, ready-to-wear Donna Karan New York doesn’t play in the same sandbox as DKNY; they could be two different companies for targeting customers. In my valiant effort to be judicious, I give this subject tremendous consideration. But, because action and words are rarely the same, where I start and end, really make very little difference to my wallet. As such, I typically begin at DKNY because, historically, it seems that I have bought more there. Don’t get me wrong, both labels are equally fantastic, which is usually the case. As I surf the pages of beautiful apparel, I have officially died and gone to fashion heaven. I’m overwhelmed by how many items meet with my personal ideal. Pure fashion bliss. Before I know it, my cart is full. This campaign, new since we last wrote, includes both Fall/Winter 2018 as well as Holiday 2018. It draws upon individuality and each individual’s unique story. This celebration of diversity includes a concept of assigning custom percentages that add up to 100% for yourself, and 100% DKNY. Models Soo Joo Park, Alanna Arrington & Dilone are featured and bring a trendy, hip and cool presentation. You must check out what makes them each add up to 100%. I sat pondering this concept for a few minutes. Am I 50% work, 30% gym, 20% chocolate? Join in on the fun and give it a try it for yourself. Use the Hashtag #IAMDKNY on Instagram or upload your photo directly from the Holiday Campaign 2018 page on the DKNY website. Back to fashion… the collection is described as a whirlwind of activity and adventure. There are 78 pieces in the Holiday 2018 collection but many more on the site from the Ready-to-Wear FW18 collection, one better than the next. Saying “It’s a wardrobe made to celebrate” is really an understatement. I didn’t have to look far to find personal favorites, including the Striped Velour Tank. When you’re ready for gifting, this Holiday collection includes several items that fashion-conscious recipients will love. Another “best of both worlds” scenario. Shop for you, shop for others. 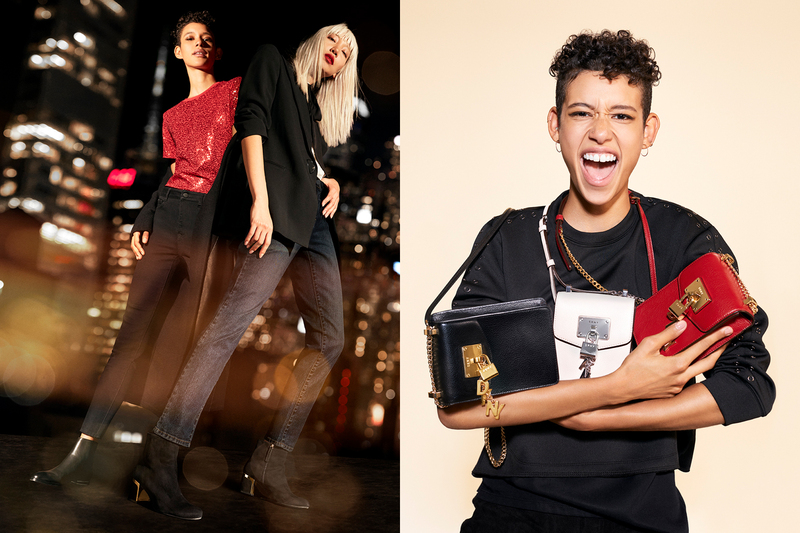 As DKNY also states, “meet the season of giving with pieces steeped in function and fantasy – for yourself, or somebody else.” Nothing is truer than this a collection of understated glamour with an elevated ease that will take you from desk to dinner, to dance party. 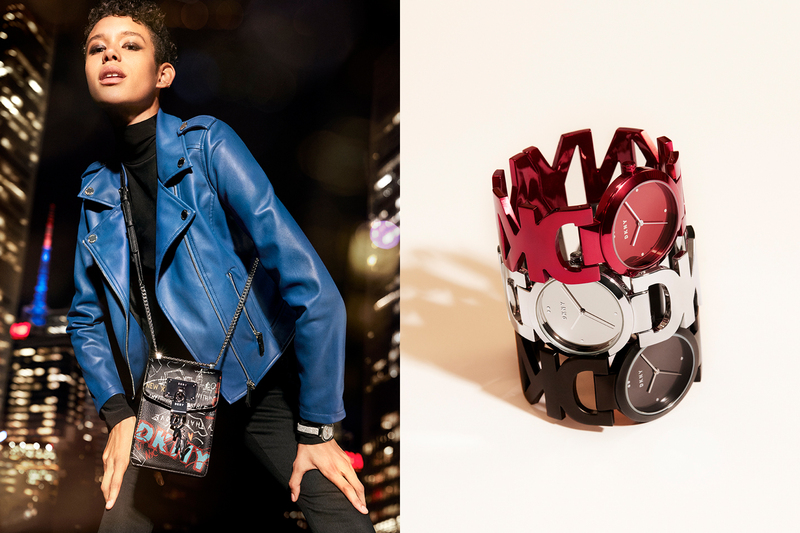 It’s 100% holiday and 100% DKNY. I’d really be remiss if I didn’t also share some of my other favorites from the Ready-to-wear FW18. There is just so much to love. If you could see my closet you’d understand why the Pullover Sweater with Contrast Back is at the top of my list. I love the draping, the flow of it, the way it looks with jeans, that you can wear without worrying about what your stomach looks like around it. This sweater is cut with ease, the cotton-blend accentuates effortlessness with a fluid, contrasting back cut in a graphic check pattern. A mix of textures and elegant silhouettes, it’s a sophisticated take on cool-weather layering. What more could you want? This is where I practically melted in my “fashion to die for” comment. The High-neck Houndstooth Top, a name that does it absolutely no justice. With a high-neck and long, raglan sleeves, and a hem that hits below the hip, this graphic mix of classic houndstooth and vertical stripes harmonizes with an exquisite draped silhouette. Looking at how gracefully it drapes, it’s just pure eye-candy. A sophisticated finish to a versatile piece, I revel in this look. With the greatest show of respect, I plead with you to show some benevolence to yourself by gifting this one to your own closet. Next on my wishlist is the Button-up Tunic with Flared Hem. You can never have too many tunics. Tunics are my go-to for everything, particularly when the jeans are just a tad too tight and I need to cover something up. This tunic, however, is special. Polished and fluid and can also double as a shirtdress. It’s elegant, drapes the body with an exquisitely-sophisticated silhouette. 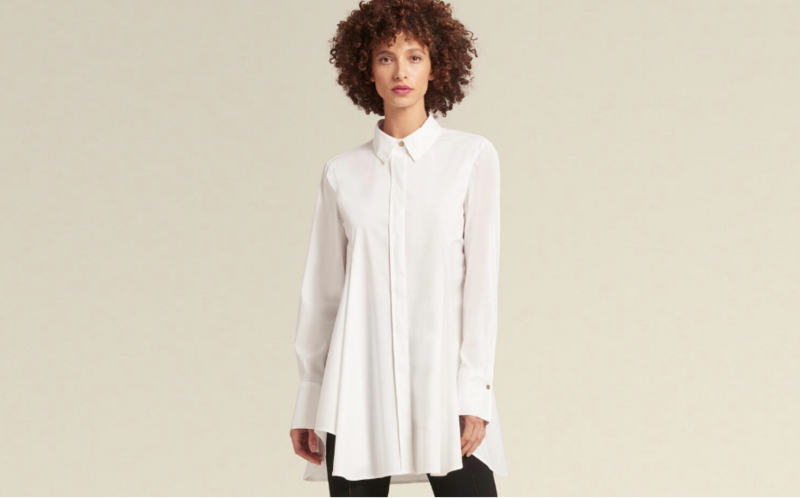 I do have one concern about this tunic, that isn’t a deal breaker but definitely raises some level of curiosity…if it’s a tunic and a button-up/down, that’s an awful lot of buttons to get in and out of it, unless it’s roomy enough to go over the head? Other than that, do you see the pattern we’ve formed here? This whole write-up seems to be a compilation of coincidences. Our favorite picks all seem to have similar drapey flows with sophisticated silhouettes. Can you say #OBSESSED? While they come in two colors, there is something special about pink camo that has me fashion-smitten. The High-Waisted Camo-Print Logo Legging in pink camo-printed mesh, with an ultra-flattering, high-waisted crop silhouette has peaked my senses and defines exactly why DKNY continues to earn its place in fashion royalty. DKNY says these leggings are “destined to become your favorite piece of workout gear.” Only workout gear? They haven’t arrived yet and I’ve already worn them to the mall, lunch, Starbucks, mani- and pedi- , walking the dog, etc. and all the other places my mind has taken them. These are too awesome to use only at the gym! To bring the campaign to life, DKNY invites you to tell your story through your own personal percentages – all adding up to 100% DKNY. Exclusive only for Dubli customer, take 30% off your purchase using code DKDUBLI30 at checkout until December 2. Combine this exclusive promo code with up to 5.6% Cash Back for a limited time only.